It seems as though we are constantly being bombarded with new terms and jargon. I often find it hard to follow my own kids’ conversations as some of the words they use are completely foreign to me. One of the latest terms that is circulating on the internet is “life hacks”. What is a “life hack”? I often browse sites that share “life hacks”, as I am always on the lookout for new and creative ways to do life in a more efficient way. Here is one that I found, tried and modified to better suit my needs. I saw this great idea for gift wrap storage on Pinterest. This hack was both easy and cheap, but I wasn’t totally impressed with it when I tried it out. The concept is simple. Cut a toilet paper roll lengthwise and slide the cardboard over the gift wrap roll to keep it secure. Unfortunately, it takes very little for the cardboard toilet paper roll to become stretched and not have enough “spring” to hold the paper in place. 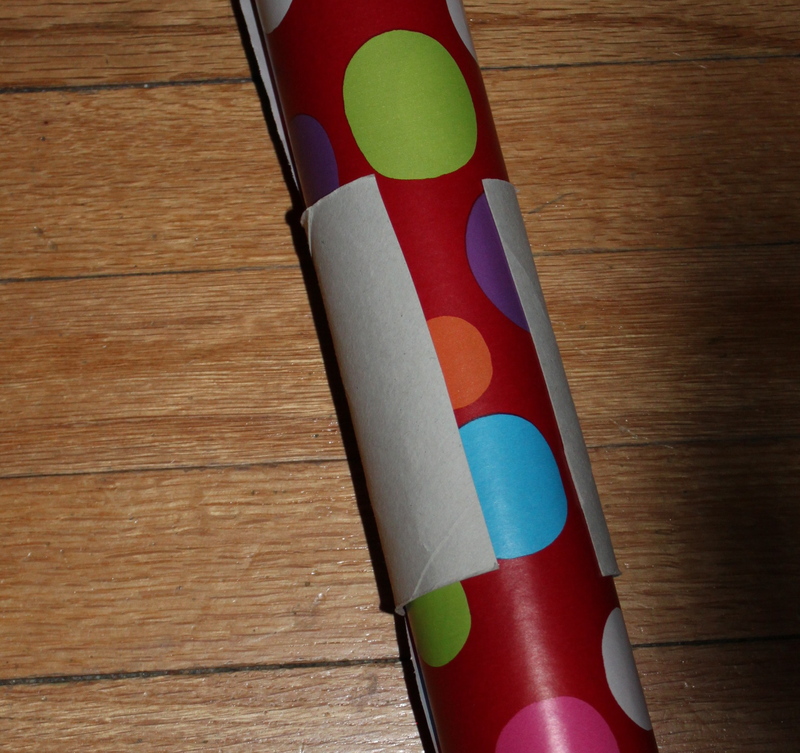 This gift wrap roll is fat, so it works okay, but I can tell that with only a few uses, it would be stretched out of shape and no longer stay in place. I was really disappointed as I thought this was a great idea. So, I came up with an easy fix. All you need are regular brads and tiny hair elastics which can be bought at the dollar store. A bag of 100 is $1. (Lets hope you don’t need all 100 for gift wrap or you may have more serious problems than how to store it). Punch 2 holes in the toilet paper roll, stick a brad in each and stretch the elastic across to hold it securely. The great thing about this is that you can modify it by cutting out a section of the roll to make it smaller to fit around those skinny rolls of paper as well. (Otherwise, the standard size roll actually overlaps and slides right off of it). It literally takes seconds to make these and they work really well. Cut a slit down the toilet paper roll. Tiny hair elastic, brads and toilet paper roll. Use the elastic to secure the toilet paper roll. Now, if you are like my husband you might be saying….”that is supposed to be better than a regular elastic?” Check out this spoof video on some of the life hacks that are circulating on the web. Funny. Often times, some of the “life hacks” seem like they are way more work than they are really worth, but I like this one because I find that tape damages the paper and an elastic often ends up cutting the paper. Of course, if you make several of them, you can re-use them over and over again.